OandO ShutUp10 means you have full control over which comfort functions under Windows 10 you wish to use, and you decide when the passing on of your data goes too far. Using a very simple interface, you decide how Windows 10 should respect your privacy by deciding which unwanted functions should be deactivated. OandO ShutUp10 is entirely free and does not have to be installed – it can be simply run directly and immediately on your PC. And it will not install or download retrospectively unwanted or unnecessary software, like so many other programs do these days! Windows 10 wants to give users the easiest possible daily experience and in doing so very rarely forces you to actually read and confirm a security notice. Unfortunately, this simplified approach from Microsoft means much more data is passed onto them than many users would like. Microsoft uses most data to display personalized information to you that is aimed at making your computer life easier. As an example, Windows 10 can remind you to set off to the airport 30 minutes earlier due to traffic en route. In order to deliver this information to you, however, Windows 10 has to access your calendar entries, your mails (i.e. the airline confirmation email), your location and it has to have access to the internet to get traffic news. Some services protocol your entire keyboard entries, share your WLAN access data with your facebook contacts or connect your computer without asking permission to a public – and potentially unprotected – network. While this means that you and your contacts do not have to grapple with complicated WLAN passwords, it also poses a significant security risk. Decide for yourself how important your “comfort” is when weighed up with your privacy and how to protect it. 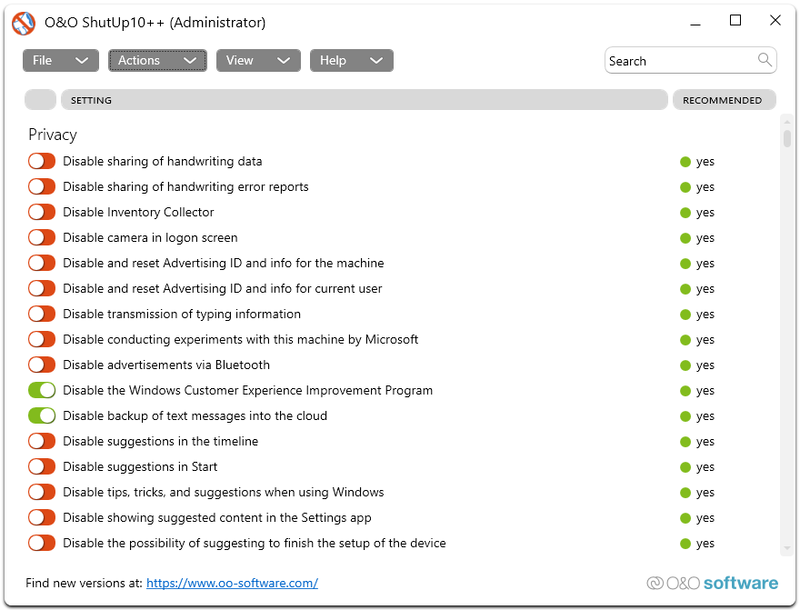 O&amp;O ShutUp10 presents you with all important settings in one location – you need no previous IT knowledge and there is no need to manually change the Windows 10 system settings. 1,986 7,178 OandO Software GmbH <img src="https://www.oldergeeks.com/downloads/gallery/thumbs/ShutUp10start_th.png"border="0"> Mar 26, 2019 - 11:31 1.6.1401 885.8KB EXE , out of 13 Votes.